Tons of video content across range of topics for CCNA R&S, from Kevin Wallace! 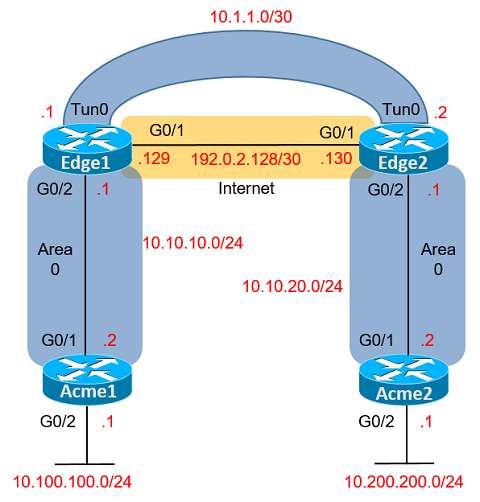 Many enterprises use GRE tunnels, either directly as configured in this lab, or multipoint GRE tunnels as implemented with DMVPN. Getting a good handle on the basic GRE encapsulation and configuration is a good beginning step for a CCNA to learn before moving into the details of configuring IPsec encryption to be used over that tunnel. 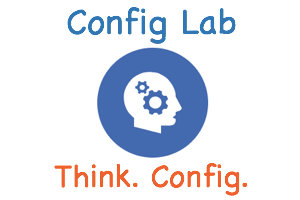 For this lab you are tasked with configuring a manual point-to-point GRE tunnel between Edge routers, and then configuring OSPF over this newly configured tunnel. This lab differs from the earlier labs because it utilizes tunnel source IP addresses (instead of interfaces), and tunnel destination hostnames (instead of addresses). The lab instructions ask you to configure the source IP address directly (that is, do not reference the interface in the tunnel source command). So, looking at Examples 1 and 2, the two tunnel source commands simply refer to the IP addresses just mentioned: 192.0.2.129 (Edge1) and 192.0.2.130 (Edge2). Next, the lab asked you to use a locally-defined hostname to refer to the tunnel destination. The Examples use obvious names, for instance, using the ip host edge2 192.0.2.130 command on Edge1 to define a hostname for Edge2’s address. Similarly, Edge2’s configuration uses the ip host edge1 192.0.2.129 command. Once configured, the tunnel destination commands can just reference those hostnames, with the tunnel destination edge2 command on router Edge1 and the tunnel destination edge1 command on router Edge2. At this point, the GRE tunnel itself has been configured, and the next step is to enable IPv4 and then OSPF. Per the figure, Edge1 uses address 10.1.1.1, with Edge2 using 10.1.1.2, both with mask /30. Then both routers’ tunnel interfaces need the ip ospf 10 area 0 command, which enables OSPF for OSPF process 10, and places the tunnel interface into area 0. Note that OSPF process 10 had already been configured on both Edge1 and Edge2 per the initial configuration; that initial configuration is how you would know to use a “10” in the command as the OSPF process ID. I think that the address in the example 1 and are not correct. you should write ip address 10.1.1.1 and ip address 10.1.1.2 instead of ip address 172.16.1.1 and 172.16.1.2. Yep, you are right. Just fixed it. Thanks for the heads up! !